All classes are on Wednesdays from 2:00-3:30 pm, 2 times/month, until the end of June. All classes are held at the Chouteau Township Office 906 Thorngate Road Granite City, IL 62040. Seating limited to 6. To register, you must have a valid library card. Wondering what you can do on a computer and what all the excitement is about? Take this class to learn to use a computer, work with Windows and use basic software programs. This is a hands-on class that will acquaint you with a computer and teach you how to begin using it. Having trouble finding what you need on the Internet? Come to this class and learn the best way to search for the information you want. You will get to try out some search strategies online with plenty of time to practice. about Facebook, become a member of this free website and post messages and photos online. After this course, you will be able to continue making friends and using Facebook on your own. Posted in News, Events, & Classes | Comments Off on Free Computer Classes! We’ve found some local history treasure! Letter to L.P. Frohardt from the Granite City School Board. Dated June 14, 1897. On letterhead from the St. Louis Stamping Company, which was owned by Granite City founders Frederick G. and William F. Niedringhaus. L.P. Frohardt was Granite City’s first superintendent of schools and Frohardt School bears his name. 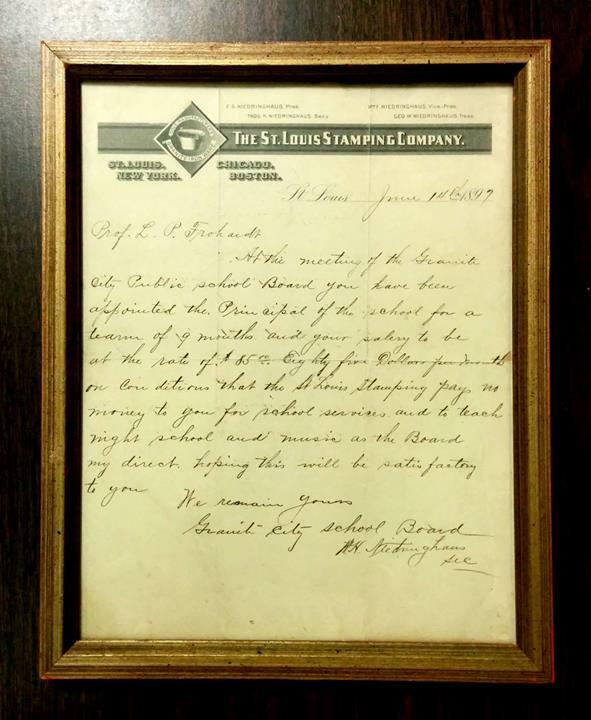 Also of note, the man listed on the letterhead as treasurer of St. Louis Stamping Company, George W. Niedringhaus, had a school (and our temporary home) named after him, too. Posted in Local History | Comments Off on We’ve found some local history treasure! The April Book Club selection is Where’d you go, Bernadette by Maria Semple. Register and Pick up a copy of the book at the circulation desk! Join the discussion on Monday, April 21 at 6:30 PM at Niedringhaus School and Tuesday, April 22 at 6:30 PM at 2145 Johnson Road. Posted in News, Events, & Classes, Reading Program | Comments Off on April Book Club! Join us for Medicaid sign ups with the Madison County Health Department: every Wednesday in April (2, 9, 16, 23) from 5 pm to 8 pm at Niedringhaus School 2901 State Street. Join us for Tales for Tails every Monday evening. Youth in grades K-5 may show up anytime between 6 and 7 p.m. to practice reading to a sweet furry listener. Bring a favorite book or choose one when you arrive at our Niedringhaus School location. Granite City High School Alumni and Wall of Fame inductee Gib Singleton recently passed from this Earth. He is known worldwide as a modern master of bronze sculptures. We are planning a showing of some of his artwork at the renovated library building later this year. We only wish he could have enjoyed the show. Published on Mar 4, 2014 A short video, produced by Rob Reid, recalling the works and life of artist Gib Singleton. America’s foremost religious and western sculptor.